See what former ALP MP Gary Johns wrote about this today in a piece entitled "Labor has a bet each way on optional preferential voting"
Someone probably wrote about that at the time, but that was then and this is now. It is not the ALP that are struggling to retain power in Victoria. Green is ,of course,correct. The Victorian Libs are in dire straits and will do anything to improve their position.They pretend that self-interest is community-interest. Victoria is ALP heartland, but dire straits ? I find it surprising the libs are competitive down there. I find the state interesting as when the ALP are on the nose this state does turn on them, but bounces back a lot. Ideologically you think the more socialist party (allegedly) would support optional voting, but I guess you go with the policy that suits your voter base. Based on the ALP commentary they would do worse under such. The Victorian Liberals are on the nose half way into their first term and recent opinion polling has been dire. I understand that Federal polling is better for the Liberal party in Victoria but I don't have any figures to hand that supports this. I think Possum's Pollytics or the Poll Bludger would have some figures on this. As for Victoria being ALP heartland, it wasn't that long ago that it was considered to be blue-ribbon Liberal party. Many of the quirks of our voting system were introduced by particular parties for opportunistic reasons. Preferential voting was introduced by conservative parties decades ago when the ALP was the sole party of the left and there were multiple parties on the right. The ALP have also made changes on other occasions. It's a rare political party that won't take the opportunity to change the system for their own benefit if the opportunity presents itself. In this case it is the Liberals in Victoria that may be considering this. You pretty much agreeing with what I am saying, but you need to look at in the national context, primary ALP voting is usually higher in Vic and SA. If the ALP is struggling in these states then nationally they deep poo. As I said I am surprised they were competitive, let alone won down there. In 2010 the Liberals won by 45 seats to 43. That is not a large win, the previous Premier did not enjoy much personal popularity, and the ALP had been in office for a while. After the Liberals elect a Speaker, the margin is one seat. So they won, but it wasn't a landslide win. Hardly, when the ALP and Coalition were pretty much even on the polling going into the election. You're drawing some odd conclusions by asserting that 45-55 (Coalition behind) means the Coalition is less "on the nose" than 50-50 (ALP) for the ALP. Look at the raw numbers. The national context is what Federal opinion polling shows. A 51-49 Coalition lead is not "deep poo", such a lead this far out from an election means the election is winnable by either side. Antony Green has published an analysis on his blog which suggests that the adoption of optional preferential voting for State elections in Victoria is likely to favour the Coalition quite heavily. He asks the question: Would Optional Preferential Voting have Changed the 2010 Victorian Election result? He shows that in ten electorates where preferences changed the result, the preferences flowed to the ALP in a ratio of roughly 70 to 30, giving the ALP all ten seats. 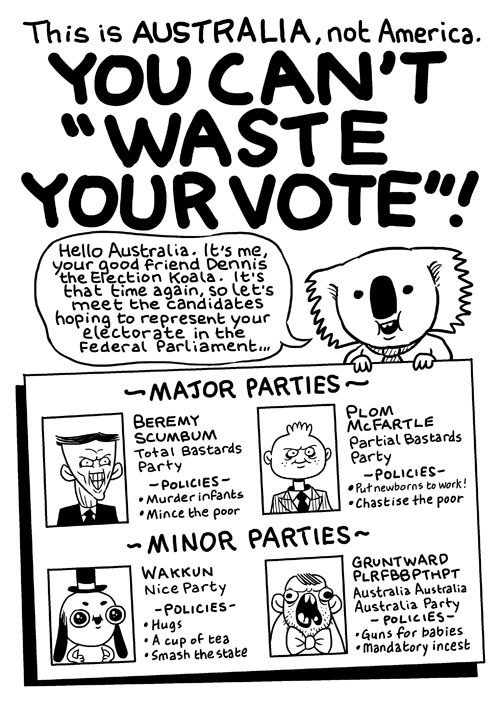 The reality however, is that no one really knows how optinal preferential voting would really change things if at all. The assessment that it would favour the Vic Libs is countered by similar analyses I recall fromt he pat that it would favour the ALp in other states. The question shoulve never be who it favours but rather should it be there or not. Gillard 'won' the election on the basis of green preferences. If there had been optional preferential voting, would one or more seats have fallen the other way> Who knows? More importantly, it doesnt matter. 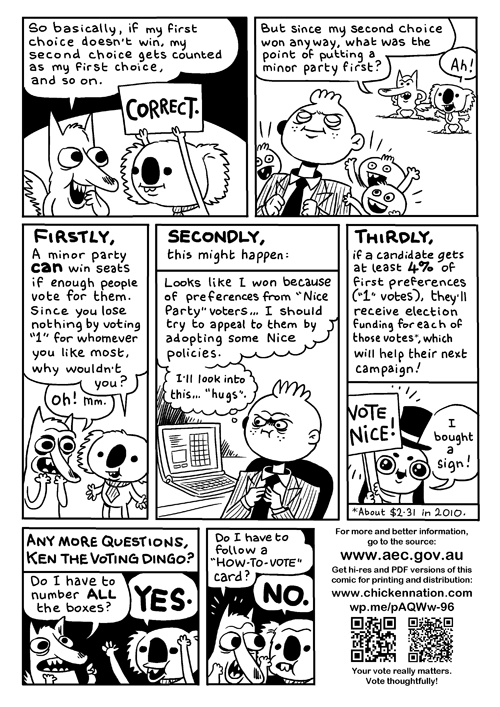 Optional preferential voting permits voters to give their REAL preferences rather than being forced to allocate a preference when they dont have one at all. We should not be afraid of any electoral change that more accurately reflects voters intentions and wishes. The outcome of it is irrelevant if it is closer to accuracy. 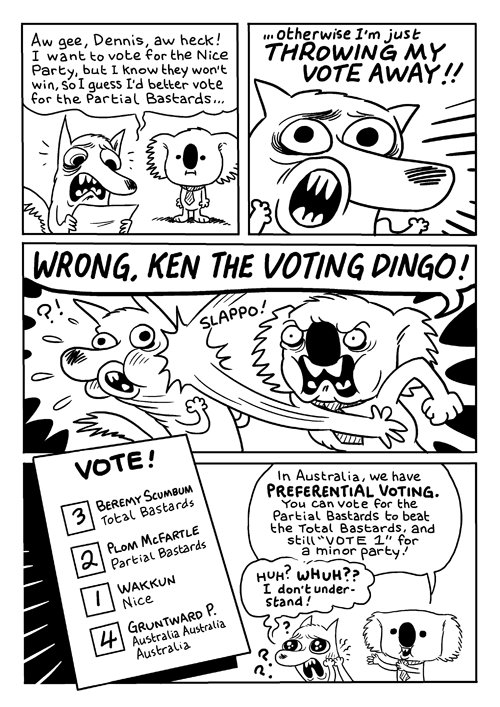 The reality however, is that no one really knows how optinal preferential voting would really change things if at all. The assessment that it would favour the Vic Libs is countered by similar analyses I recall fromt he pat that it would favour the ALp in other states. Can you recall where you read these other analyses? It would be good to provide some additional perspectives so we had some balanced views on this. IMO the party that is favoured by the electoral system changes from time to time. Green's analysis was interesting but it was limited to one election. It was some time ago and I believe it was in a newspaper or magazine. the point is that most of these analyses of who they benefit or not tend to even out. But even more importantly, it is irrelevant. As long as the genuine wishes of the people are counted and made visible, the methodology and who is 'advantages' makes no difference. It is my belief that preferences are in the main, not genuine. Most people vote according to the party card and except in rare situatinos, parties place preferences strategically rather than according to ideologogy, policies or ability. A voter presented with the opportunity to vote for first preference only or first and second gets the opportunity to not see their vote go a place they did not intend. That is not predictable to any degree of accuracy. Once people get to understand that they can vote for whoever they like and preference a second choice or not, thigns will change. I also think the preferential should be changed in a way that might seem dramatic but is in reality only likely to affect a few seats - if at all. it does sometimes happen that a winner on the first preference round may lead the second by a very large margin of 10% or more. But because of the allocation of preferences - which I maintain are not really genuine - the second candidate gets the nod while being voted for by less people. Steve Fielding is the classic case where everyone gave FF their second preference and ended up putting him into the senate despite getting very few actual votes. I believe that a winner shoudl be declared not when they reach 50% of the vote but also if they are X% ahead of the second candidate. I would suggest a figure of 10% here which means it would affect few seats but would eliminate the unwanted candidate getting into power. When the preference votes are allocated they become 'actual votes'. And your point is what? Some procedural gem you think no one was aware of? I believe that a winner shoudl be declared not when they reach 50% of the vote but also if they are X% ahead of the second candidate. I would suggest a figure of 10% here which means it would affect few seats but would eliminate the unwanted candidate getting into power. It won't work. There would be a lot of contests with no winner. you misunderstand me. I mean that the current rule of reaching 50% would remain BUT in addition, if the leading candidate is ahead by 10% at anystage and not yet reached 50% they are declared the winner. This would prevent the occasions of a primary vote getter of 45% being ultimately defeated by one that gets 30%. And before you ask, this would affect all parties equally. In fact, if anything it would cause trouble for the coalition int he handful of sets where national and liberal candidates stand. Thank you for your clarification. I think this method is cumbersome and the 10% margin is too arbitrary. However, I know your reasoning behind it. A simpler method would be to take the top two candidates on primary votes and choose one of them based on the flow of preferences. Had that method been applied in the 2010 Federal election, Wilkie would not have won in Dension where he was third on the primary votes behind the Labor and Liberal candidates but ended up winning the seat. For Senate voting where there are quotas, such a method is more difficult but could be applied once there are no candidates remaining with a full quota of votes. Choose the remaining candidates with the greatest number of votes to form a pool of N+1 candidates where N is the number of unfilled quotas. However, the Senate system does work, after a fashion. Where I think it needs work is above the line voting. I would love voters to have the ability to number as many boxes above the line as they wish, so as to reduce the impact of preference deals. The current system favours candidates with good negotiation skills too much. The power to elect candidates should be given back to the voters, where it belongs. Your method might stop the third-ranked candidate from winning but it does nothing for the more commen example of the second candidate winning the seat while being a huge margin behind on first preferences. teh 10% figure is arbitrary I grant and would probably need more assessment as to the proper figure but it needs to be fairly high in the 8-12% range. it would rarely come into play and only in the unfair situation of someong coming from several laps behind on the basis of preferences. Your idea is unsound, it's essentially the same as first past the post. Why go to all the rigmarole? The trouble with first past the post is that it is not very democratic, especially if there's more than two parties. We originally had first past the post but the conservative parties didn't like it because it gave the ALP too much power so it was abolished decades ago (I'm not sure when, 1920s?). Now the balance goes the other way more, with the ALP and Greens splitting the left-leaning vote while most of the conservative vote is the Liberal party and Nationals (mostly) who rarely contest the same seats. We have preferential voting to reduce the chance of the votes on one side or the other cancelling each other out. The preferential system works reasonably well. Where it fails is in the parties having too much control in how people vote with how-to-vote cards and Senate tickets. This is where the problem really is. If how-to-vote cards were abolished, would the system work better? its not first past the post at all. 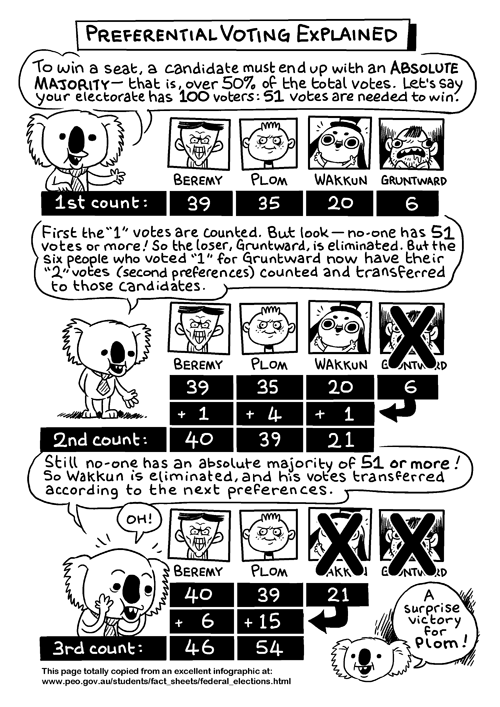 it is still preferential voting with just ONE alteration which is to remove the possibility of someone winning when they are 10+% behind. They can still win if 9% behind whch is certainly not first-past-the-post. Im not in favour of FPTP. I am in favour of optional preferential but wih the added safeguard of what I propose. This proposal is made simply because second preferences etc are not at all as genuine as first preferences. The vast majority choose their first preference and the rest are just the party's allocations - not theirs. And that is not deniable. What are your views on how-to-vote cards and Senate group tickets? im not sure what you mean. Most people want them and only the senate ticket is part of the Act to reduce informal voting in uber-long senate tickets. My position is that such how-to-vote cards are the STRATEGIC moves by parties and are not necessarily ideologically or morally chosen. since most people vote according to the card, their preferences are not necessarily their legitimate ones and as such I dont think should be accorded the same value as a primary vote. It is these remarks I was alluding to. I believe you would have an interesting viewpoint. Most people want them and only the senate ticket is part of the Act to reduce informal voting in uber-long senate tickets. My position is that such how-to-vote cards are the STRATEGIC moves by parties and are not necessarily ideologically or morally chosen. since most people vote according to the card, their preferences are not necessarily their legitimate ones and as such I dont think should be accorded the same value as a primary vote. Your viewpoint on Senate voting is interesting, and it is a valuable time-saving measure. Do you think Senate above-the-line voting be more useful if one could number as many boxes above the line as one wants rather than being constrained to number only one box?